Leading Manufacturer and Exporter from Mumbai, our product range includes Power Bank such as Credit Card 2500 mAh Power Bank, Advent 10500 MAH With Samsung Cell, 4000 mAh Power Bank with Built-in Speakers, Advent 5200mAh Power Bank, Solar Power Bank, Various range of Power Bank and many more items. with Customized branding. A perfect combination of power, size and weight. This power bank fits easily in your pocket and wallet as well. Comes with 10000 mAh capacity. Large branding area. Compatible with wide range of range of device. Only Wholesale inquiries (100 qty +) no retail please. 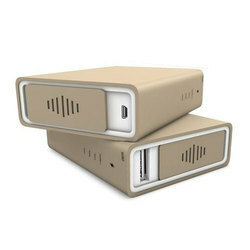 We are offering a premium quality collection of 2500mah Power Bank to our customers. 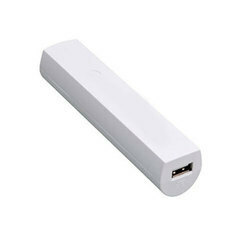 Also, customers can avail these power banks in bulk quantities at competitive prices. 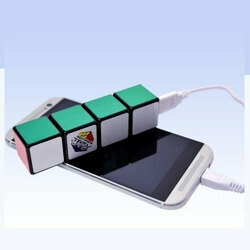 We are providing Innovative Rubik Cube Power bank. We have been laying paramount importance to the quality of the products provided by us, which is in turn evident from our impeccable range of Power Bank. we understand that at times when you travel, you experience stress and anxiety due to un-managed travel documents, tickets, passport etc and due to mobile phones being low on battery. 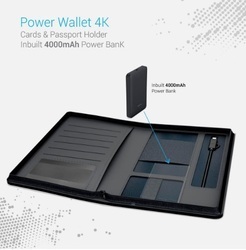 To solve these two challenges for travellers, and make their journey easy and memorable, we have launched Power Wallet 4K a Traveller’s Delight which is India’s first Passport Holder with an in-built 4,000 mAh Powerbank and Dual Connector Charging Cable. 1. Highly Compact and Lightweight with dimensions similar to your phone . Fits easily in your palm along with your phone making it easy to carry around while it's charging the phone. 2. Dual input charging : one with 1A Lightning port and other with fast charging 2A usb port. This gives you freedom to carry ONLY ONE cable to charge your phone or the powerbank itself. Now No need to carry two cables on your trip or everyday even if you use iPhone. 4. Designer style give great refined look which suits your dapper personality. 5 strong and durable Kraft packaging ensures great safety while storing the device. 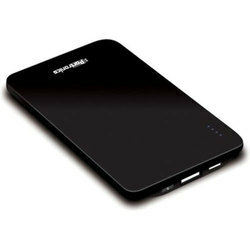 We offer quality imported full battery 2500 mAh Ultra Slim Credit Card type Power BanK 2500 mAh. 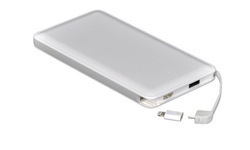 Ultra Slim Power Bank can power your Iphone as well as Android phones and come with an inbuilt Iphone pin. An ideal carry it anywhere portable battery charger. We offer customization Options on demand & all our products come with warranty. Charging cable is available seperately. 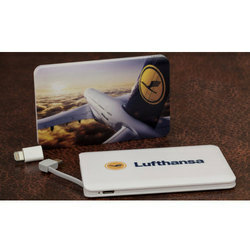 We can develop specialized and Customized Power Bank for you in any colour, design and shape of you own choice. Now your company logo,shape of your product or packaging or any idea or any concept which was in your mind will be a reality in shape of a special power bank. 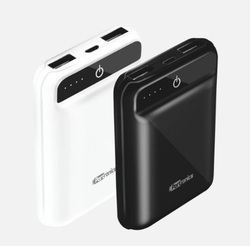 This high capacity power bank with the minimal weight, in comparison to its power, has four LED indicators which will represent the power status of the battery while being used as well as being charged. There is one On/Off button to allow and disallow the power bank to transfer the charge. The best part is that it comes with one input socket and two output sockets which mean you can charge two devices at a time. 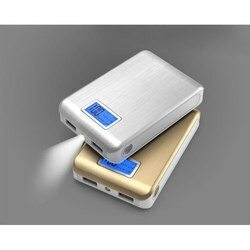 11720mAh Dual USB with LCD Display Power Bank We provide guranteed 100% battery power banks with warranty of 1 year. 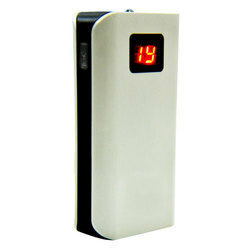 This power bank is available in White & black colors and weighs approximately 224gms. The LED indicator shows both indications of input & output. An ideal companion for a long trip out on the road sure to keep your mobile up and running for a long time. Printing and customization services are available on demand. Ready to delivery QC approved stock. 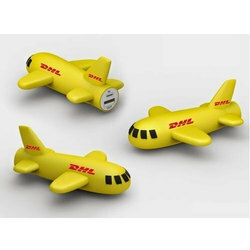 Customized Power bank as per 3D or 4D Design. We can make any shape, any design based on your Logo or Theam. Portronics Golden Cube phone charger is exactly what your phone needs while losing power. With Golden Cube, charging your phone is as easy as making a call. This charger consists of 5200mAh power bank that acts as its source. Golden Cube works on dual battery cell technology that happens to be a noteworthy invention of Samsung. With this power bank, you no longer need to worry about the ''plug in charger'' alert of your phone. 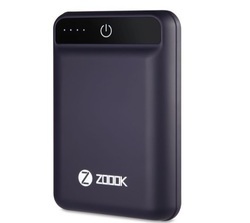 It is like a power bank reliable enough to let you use your smartphone with complete relief. 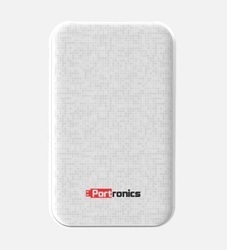 Understanding the essence and desire for style in today''s generation, Portronics has introduced its Golden Cube power bank with stylish looks and features. Backed by our efficient workforce, we are capable of wholesaling and supplying Sony Power Bank. At par with international quality standards, all our offered products are manufactured under the state-of-the-art infrastructure. We deliver all offered product at clients’ door step within the committed time frame with the help of our C&F agents. Let your clients play with your brand! 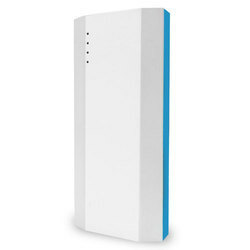 The Office Blocks Power Bank can be matched with all our Office Blocks range and used as a set. Portable speakers, a battery charger and a stand all in one product for your electronic devices such as mobile phone, tablet or MP3 player. Built-in 4000 mAh universal emergency battery. 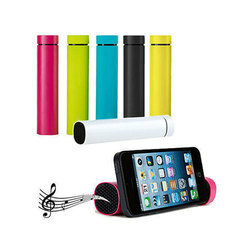 The With integrated portable power and speaker is the ideal gadget. 3 LED indicators to show remaining battery. Acts as stand smartphone while connected and playing music. 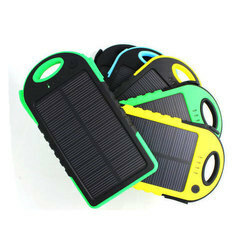 Introducing the latest SOLAR POWER BANK .These range of eco friendly solar mobile chargers which can charge all your mobiles on the go. These are in fact dual powered so when its not possible to charge through natural light you can always fall back on the option to charge through USB cord. To furnish the varying desires of our customers, we are immersed in offering a world class consignment of Ambrane Power Bank. These are made up by making use of top notch grade inputs and with the support of modern machinery in line with the pre-set standards of quality. These are credited amid our patrons for affordable pricing structure. The newest Alloy Credit Card Power Bank comes with 2500 mAh capacity with built in micro and iPhone Connector. The biggest advantage of this model is its design. Its one of the slimmest power bank in the market and the alloy material gives it a premium finish. Customized engraving of logo possible on this model. Call now for samples or quotation. 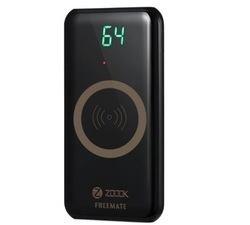 Smart capacity display ,multiple protection ,safe and high efficiency Clear & simple design ,mobile and portable. 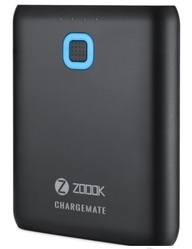 FEATURES Powerful Backup Battery: Powerful 10000mAh Hi-density lithium-polymer backup battery Automatic Voltage Regulation: Charge or run your devices safely with PBS10E built-in Automatic Voltage ZOOOK PBS10E Advantage: One of the lightest and smallest design for its large capacity. It is in credit card size, but charges most smartphones at least three times.Made To Outlast: The new high-density Li-polymer battery outlasts both conventional Li-polymer batteries and 18650 cells when it comes to efficiency, performance, and protection.Fast Charging, Full Safeguarded: The built-in 2.1A output enables to charge your device faster than before.It combines with protective system to let go of your safety worries while fast charging.Multiple Smart Protection System: keeps your devices safe from over-charging, over-voltage, over-current, and short circuit.High Compatibility: Universal USB ports (2 USB Charging Ports): Compatible with almost all smart devices with an input of DC 5V.